March is meant to herald the start of Spring. However this week it would appear March didn’t get the memo. Instead of blankets of crocuses, daffodils and snowdrops we’ve had blankets and blankets of deep, deep snow as the Beast from the East took to grips with our weather. Snow is fun but when your one and two the novelty wears pretty thin quickly and after an hour of sledging and throwing snow balls you want to be back inside the warmth of your house. So as you can imagine, with three or four snow days on the trot we’ve been in baking and cooking overdrive. March is also the month that Mother’s Day crops up in our calendar. So this month our recipes are going to be recipes from the many mother figures in my life. As well as my own mum, my gran, there’s my mother in law, who has 10 children and my seven sister in law’s who between them have 27 children. As you can imagine there are lots of mouths to feed and these women are superheroes in the kitchen, each with their own style and their own signature dish. First up is a recipe for lemon and thyme flapjacks from my mother in law Hazel. 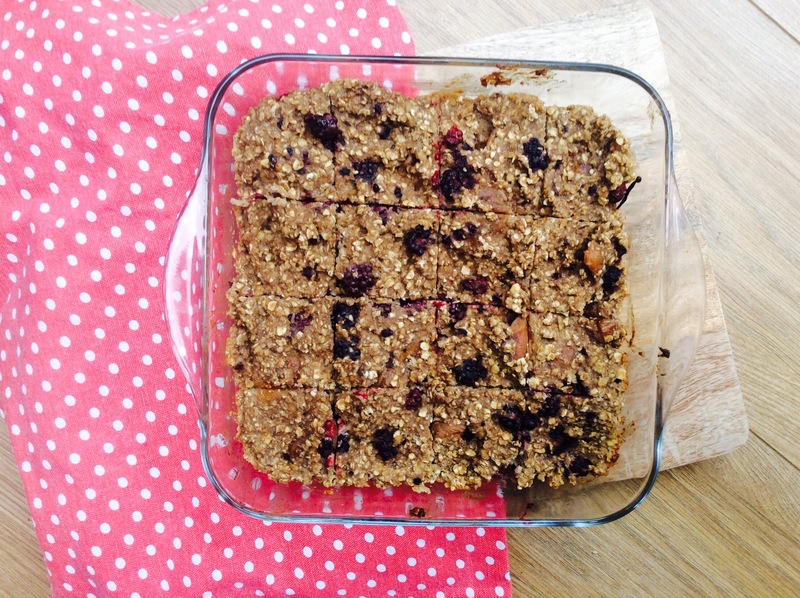 Good for the soul, these chewy tasty flapjacks go perfectly with a hot cuppa or hot chocolate as we continue to freeze our socks off. You won’t however be able to stop at just one square. You have been warned. 1. Pre heat the oven to 160C and line a 20cm square tin with baking paper. 2. Melt 175g. of unsalted butter in a pan along with 5 good generous tbsp. of golden syrup. Add in 175g. of light brown sugar and stir gently over a low heat, until combined. 3. Remove from the heat. Add 350g.of porridge oats and combine all the ingredients together. Add the zest of one small lemon and two tsp. of chopped thyme leaves. Mix everything together and transfer the mixture into the baking tin. 4. Bake for 35 – 40 minutes or until golden brown. 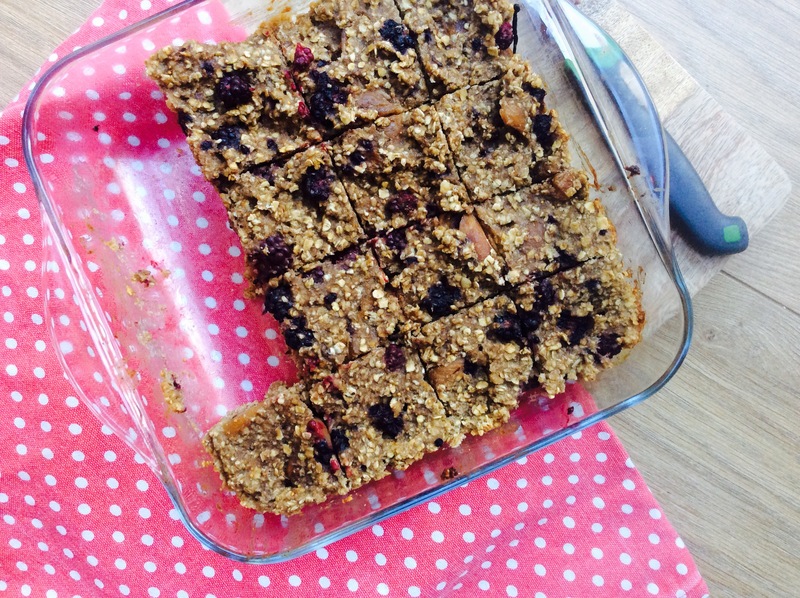 The trick is to remove the flapjacks from the oven when they are still ever so slightly spongy & gooey in the middle. Leave to cool for 15 minutes before cutting into squares. Having a two year old and a one year old in our house, we consume a lot of yogurt. In fact during fussy periods I’m sure yogurt makes up nearly 99.9 % of their diet. As a result we’ve tasted a lot of different types of yogurts, the good and the synthetic, sugar filled awful ones. Even some of the big brand ones can seem a little sugary and lacking on the creaminess front. However, not Rora Dairy yogurts. These are a definite step up. Creamy, delicious and full of flavour, they have proved a hit at breakfast time over the last week. Made on a fairy farm, just outside of Aberdeen, Rora Dairy prides itself on creating yogurts that are natural and healthy for you. Full of calcium, for developing healthy bones, and a necessity for healthy hearts and muscles. The friendly bacteria will also ensure little digestive systems and big digestive systems are kept in tip top condition. At a time when it seems that more and more of us are cutting out dairy and animal products I’m really pleased to see this Scottish Dairy making it’s mark, delivering a product that there really is no substitute for. Perhaps that’s the farmer’s daughter in me, speaking out in support of Scottish farming, but we really do need to shout from the roof tops as there are some great producers doing great things. Not only have we been scoffing the new mini pots for breakfast, they also go pretty well with our homemade granola and are equally good in our breakfast smoothies but unsurprisingly our pineapple and strawberry yogurt breakfast muffins have been a hit. Give the recipe a whirl this weekend to get your day off to tasty and tropical start. 1. Begin by preheating the oven to 180c and line or grease a 12 hole cup muffin tin or two 6 hole muffin tins. 2. Sift 225g of plain flour and 2 tsp. of baking powder into a bowl. Add 150g of caster sugar and 115g of desiccated coconut and combine all the dry ingredients together. 3. Make a well in the centre and add two eggs, two 150g mini pots of Rora’s strawberry yogurt and fill one of the pots with vegetable oil and add that into the mixture. Mix until combined but don’t over mix. 4. Finally gently fold in 200g of finely diced fresh pineapple. Spoon the mixture into the 12 holes and bake for 30-35 minutes, or until golden brown. A very belated happy New Year and apologies for the radio silence. The blog has been enjoying a much needed sabbatical but I’m back with my two mini side kicks and the Chief Taster has been doing an expert job putting our recipes to the test. We’ve found our groove and I’m excited to share with you what we’ve been working on. Since moving back to Scotland from London six months ago we’ve spent a lot of time stirring up homemade memories partly because it rains a lot in Glasgow. In fact I’m seriously thinking about penning a recipe book titled “Rainy day cooking ideas for parents in Glasgow”! I think it could be a best seller. 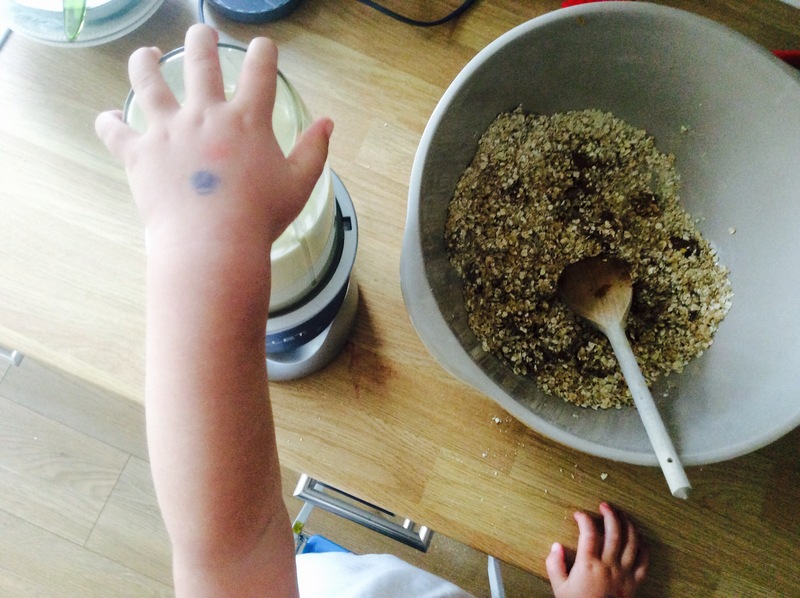 I’ve taken the blog in various directions over the last few years but this year I’m really going to be focusing on recipes aimed at encouraging adults along side their children into the kitchen. This is not a blog about first tastes or weaning recipes or even recipes that children will necessarily eat. Although that would be a bonus. 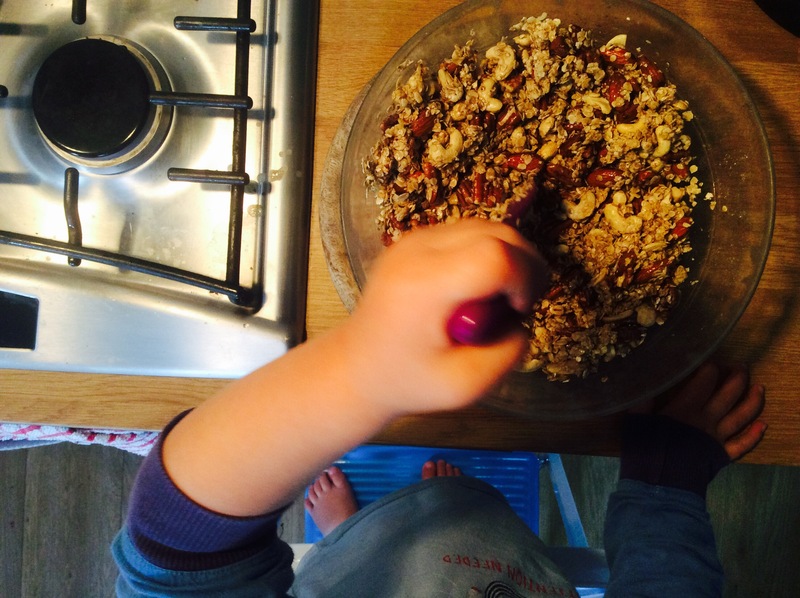 My eldest who is nearly three is such a fussy eater but loves helping me in the kitchen whether we’re making frittata or apple crumble. 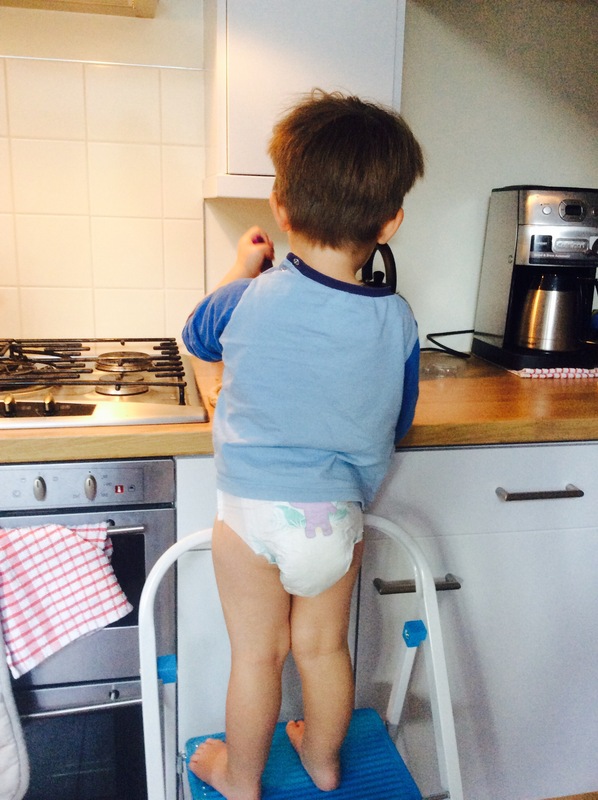 The point is to get children cooking from as early as possible. Let them feel, touch and explore and generally make a mess. Teach them about where their food comes from and what’s in season and when. I promise the fun will outweigh the chaos. The recipes however won’t be focusing on cupcakes and brownies, although there will definitely be a few sweet treats along the way. I won’t them to learn how make soups, stews, salads and smoothies, understand when which foods are in season and become more aware of where food comes from and how it is produced. In Scotland we’re lucky enough to have a bountiful natural Larder bursting with world class produce and spectacular flavours. Yet for so many the door never gets open to experience the taste sensation on offer. I was lucky enough to grow up on a farm on the West of Scotland and Otto and Reuben can experience first hand when visiting, what I did growing up and gain an appreciation with time about the hard work and dedication that takes place to produce and grow our food. As the UK battles with rising obesity levels amongst children and adults on one hand and an increase in dietary fads, making millions of pounds for a few and playing into the hands of the vulnerable and naive, there is a need to go back to basics and learn how to cook good, honest homemade food with a focus on seasonal ingredients, which are both cheaper and more delicious. I have battled my own demons with food in the past. However if there is one thing I want my children to learn is that food is not only fuel, but is something to be enjoyed. Something, which can create long lasting memories, in the preparation and in the sharing. 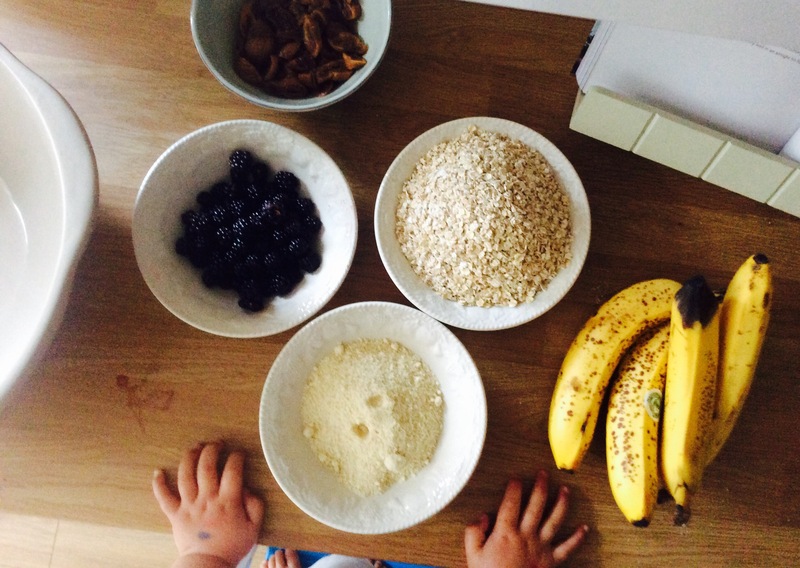 I’ve written about my top tips to get children cooking and I’ll be revisiting this again as well as other top kitchen hacks, along with monthly themed recipes, kicking off with breakfast at the heart of February. Until then as it’s been a while I have a few seasonal recipes to help banish the January blues The days may be short and dark but January is bursting with flavours. Seville oranges are at their best if you fancy making marmalade. Kale is king and pomegranates are the jewels in January’s crown, while roasted butternut squash and sweet potatoes can prove to be super versatile in either sweet or savoury recipes. January is just the start of a colourful year ahead of food, and hopefully we’ll be able to capture the imagination of a child by introducing them to the heart of the home this year. One of our favourite vegetables, kale, is enjoying something of a Renaissance, going head to head in the popularity stakes with the avocado. What I love about kale is that it is versatile. Even if you find a bag of it languishing at the bottom of your fridge you can breathe new life in to it. Scatter on a baking tray, drizzle with olive oil, soya sauce and a few sprinkles of chilli flakes, bake for 25 minutes and you’ve got crispy kale chips. Or blitz in a blender with a frozen banana, frozen mango, some mint leaves and apple juice and you’ve got an oh so good for you fruit smoothie. Or you and your mini chef could try making your own kale pesto. What child doesn’t like pasta and pesto. Right?! 1. Add one garlic clove, 30g of whole almonds, 100g of kale, a handful of fresh basil leaves, 35g of grated Parmesan, 35g of grated mangengo cheese and 4 large tbsp. of olive oil into a food blender. 2. Blitz until a paste forms and serve through pasta, on toast or on a cheese and tomato pizza! Store in an airtight container or jar in the fridge. Pomegranates are fiddly and messy but kids love to see the surprise inside when you slice it open. And the fun you can have scooping out the crunchy little gems is worth the stains and splatters. They make for a very colourful and eye catching topping to you favourite breakfast. 1. 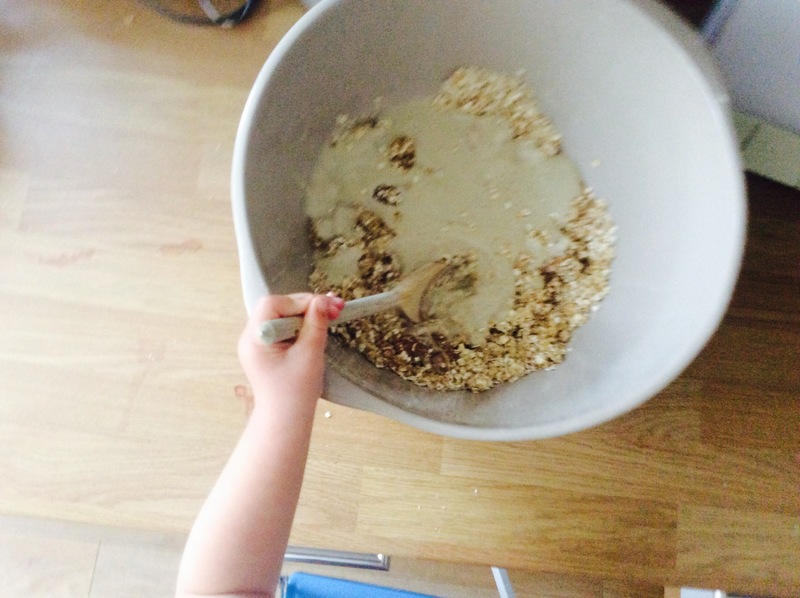 Add two cups of porridge oats to a bowl along with a 1 tsp. of ground cinnamon, half a cup raisins, one grated apple and two cups of apple juice. Mix everything together, cover with cling film and allow to soak over night in the fridge. 2. The next morning divide the mixture between four small bowls. On a dry heat lightly toast a handful of flaked almonds until golden brown. Top the bircher with a spoonful of full fat Greek yogurt, a scattering of pomegranate seeds and some flaked almonds to serve. Sweet potato chips are a go to in our kitchen repertoire. Super easy to make and super tasty to boot. As is our recipe for sweet potato and chocolate ginger brownies which we’ll share in the fullness of time. But Otto’s favourite soup to make and of course blitz using the hand blender is roasted butternut squash and sweet potato soup. 1. Pre heat the oven to 180c. Begin by peeling one butternut squash, removing the seeds and chopping it into cubes. Place on a baking tray. Then peel and chop 500g of sweet potatoes into cubes and place on the baking tray. Drizzle with olive oil and roast for 40 minutes. 2. Dice two small while onions and gentle fry in a good knob of butter in a soup pan until soft. Add 1litre of chicken stock and two tsp. of ground cinnamon. Bring to the boil and then simmer for five minutes. 3. Remove from the heat and add in the squash and sweet potatoes. Blend using a stick blender and stir in 100g of full fat creme fresh. Season with ground pepper and add chilli flakes additionally if you wish. The recipe for the brownies is worth the wait…..
*Always make sure children are supervised in the kitchen and never left unattended, especially when dealing with hot ovens and hobs as well as sharp objects. 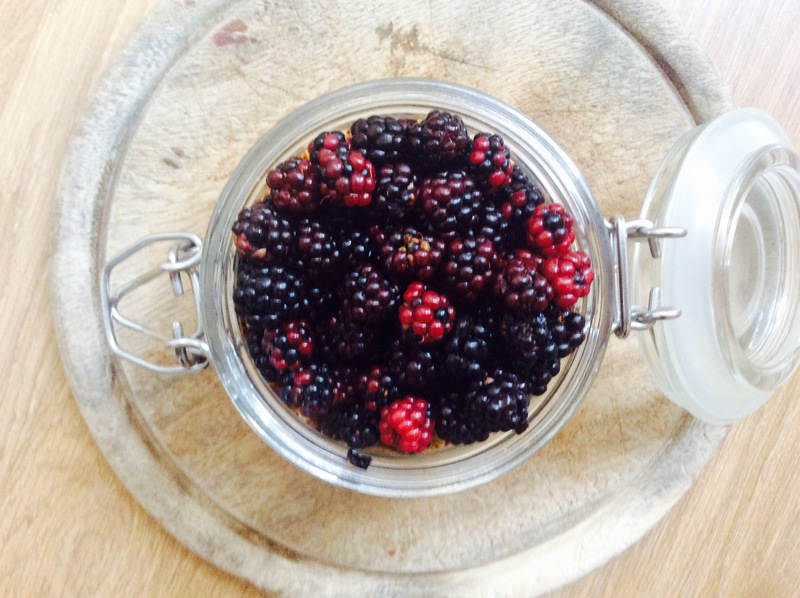 I promise this will be my last recipe using blackberries – this year! I think I may have picked the last of our supply, growing behind our house. It’s certainly been a bumper crop. 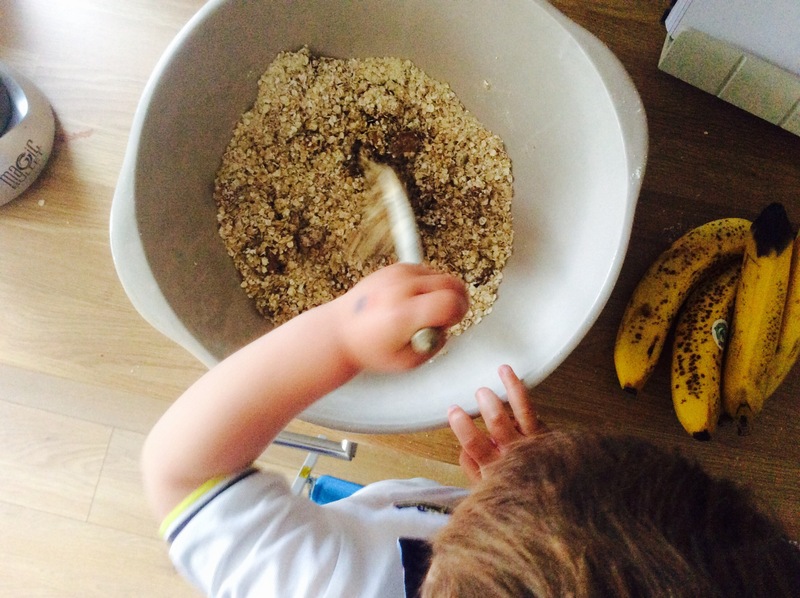 This recipe, for my blackberry, fig and banana oat bars is a great way to use up overly ripped bananas and involves lots of stirring and blitzing, which means little hands will love getting involved in the action. 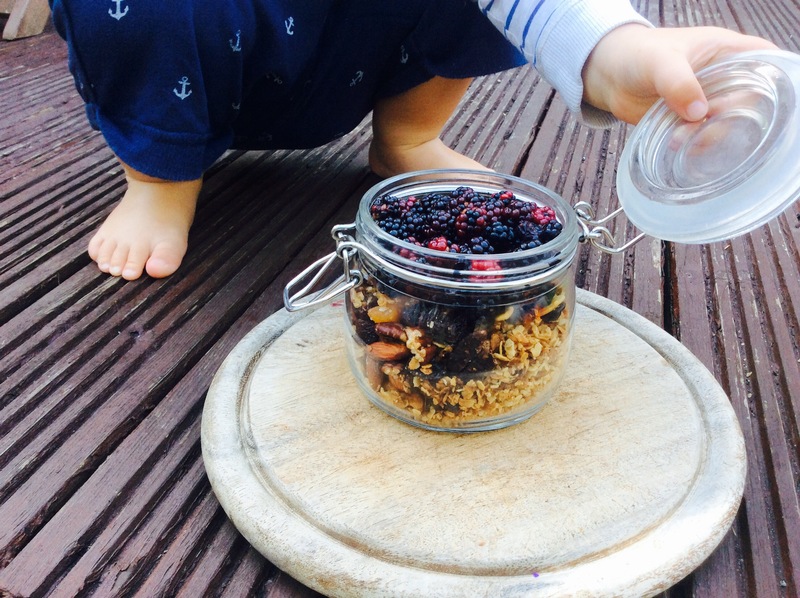 They are also super healthy and super filling, making for a super snack to keep big and little bodies fuelled for longer. 1. Pre heat the oven to 180.c and grease a square dish with butter. 2. Soak one cup of chopped dried figs in apple juice for 30 minutes. Pour enough apple juice into the dish to just cover the figs. 3. Stir together 2 cups of porridge oats, 1 cup of chopped dried figs (as well as the apple juice) and 1 cup of ground almonds. 4. Using a blender, I used a nutribulket, blend four bananas together with 1/4 cup of olive oil, until smooth. 5. 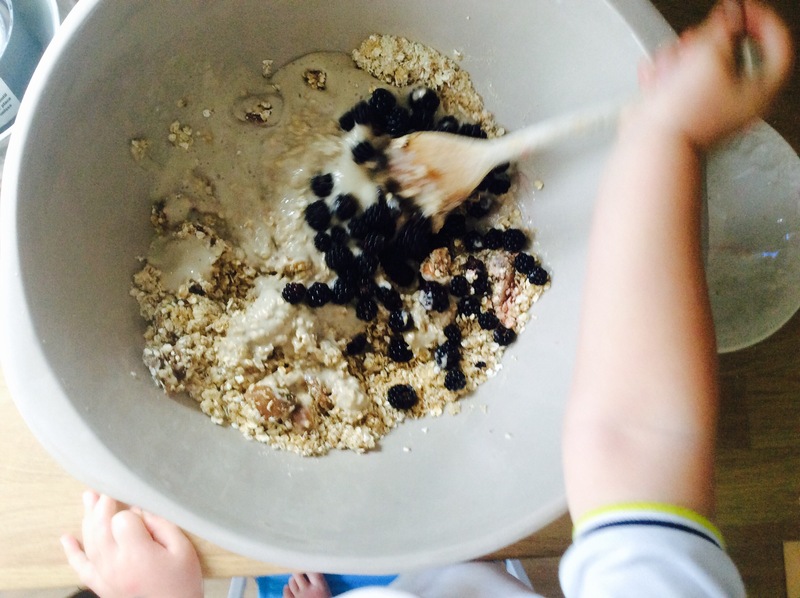 Fold the banana mixture into the oat mixture and fold in 1 cup of fresh blackberries. 6. Spoon the mixture into the square dish and spread it out evenly. Bake for 30 minutes and leave to cool before serving. We have been going a little crazy for the blackberries around our house recently. I can’t leave the house to go on a walk without taking a Tupperware dish with me. And the best bit, are Otto’s blackberry stained fingers and lips. The down side are the nettle stings, but these are soon forgotten about by feeding him up on freshly picked blackberries and then concocting a new recipe in the kitchen. This weekend we revisited the delicious blackberry clafoutis recipe, to take to family in the Borders and also made granola pots topped with blackberries to gift to more family. 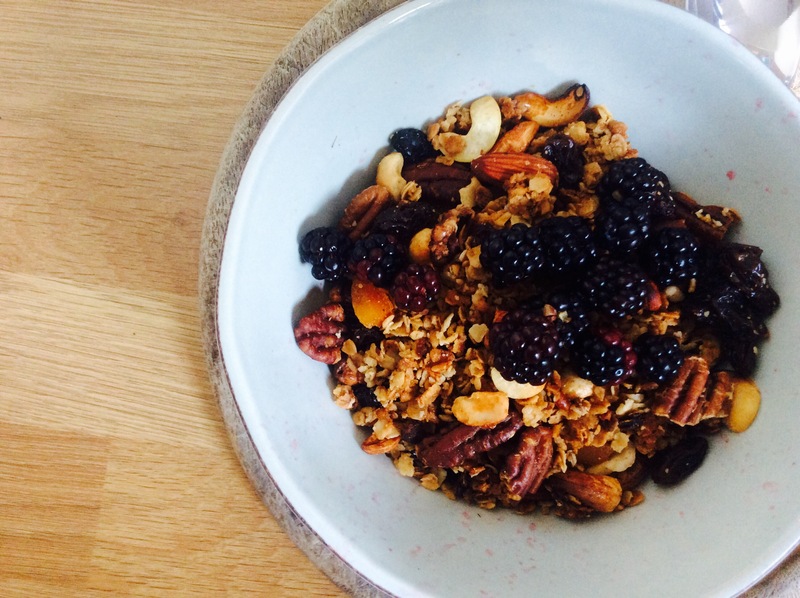 Nothing beats homemade granola. It surpasses the shop bought stuff by a countrymile and is super easy to make and is a great way to use up store coupboard ingredients and is also a very thrifty breakfast idea. 1. 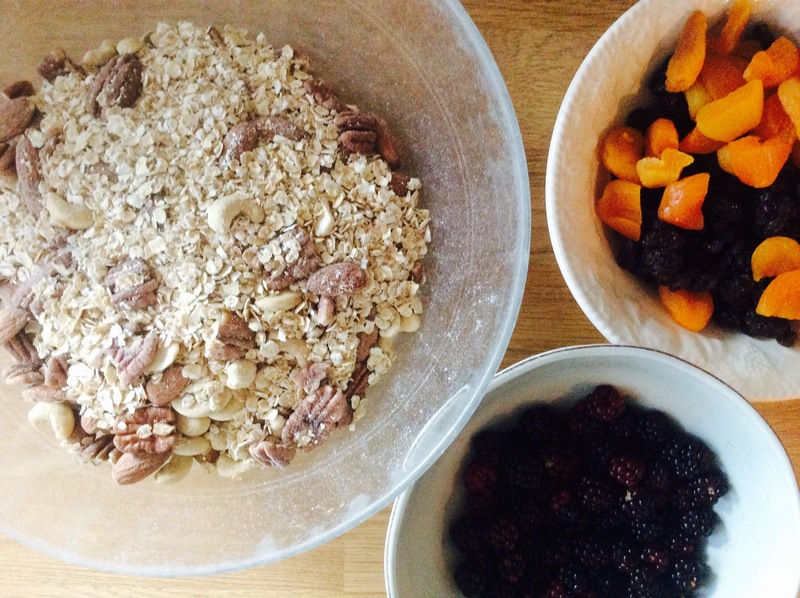 Add 1/2 a cup of chopped pecans, 1/2 a cup of almonds, 1/2 a cup of cashew nuts and 1 & 1/2 cups of porridge oats into a bowl. Leave to the side. 2. Place a pan on the hob and over a gentle heat melt 4 tbsp. of coconut oil together with four tbsp. of honey and 4 tbsp. of maple syrup. 5. Add the warm liquid to the dry ingredients and fold everything together, ensuring all the dry ingredients are covered. 6. Spread over a baking tray and bake for 20 minutes in a pre heated oven at 280.C. 7. 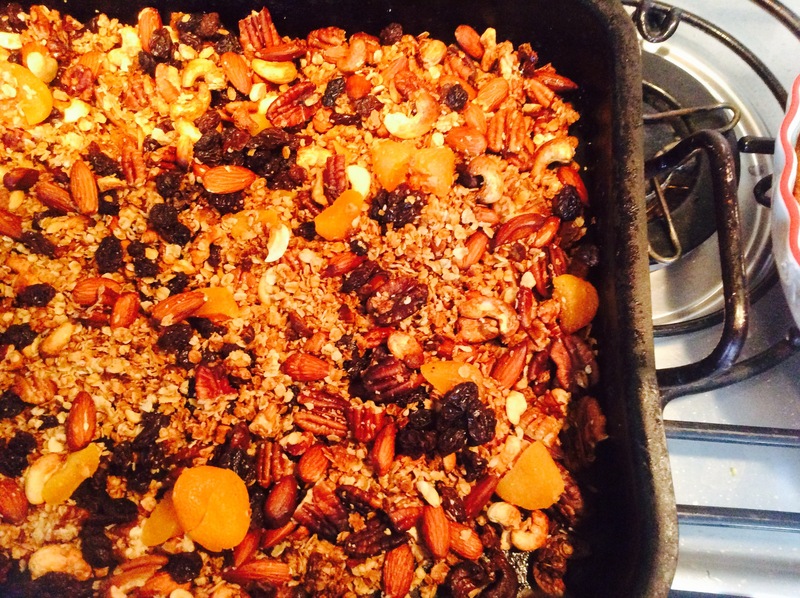 Once removed from the oven give the granola mixture a stir and add 1/2 a cup of chopped dried apricots and 1 cup of raisins. 8. Serve with freshly picked blackberries!